Some of you might recall that I attended the Houston stop of Blind Guardian’s 2015 North American trek on Wednesday, November 25th. It was an unforgettable night —- out on Thanksgiving Eve with friends who were equally passionate about Blind Guardian, amidst a giddy crowd tipsy with the revelry of not having to work the next day (they don’t call it Blackout Wednesday for nothing), and the bards playing with more vigor and energy than in any of the other two times I’ve seen them live (2006 and 2010 for those keeping count). The band was nearing the end of their North American tour, to come to a close two shows and three days later in Orlando, which made their performance all the more gratifying: That one of our most treasured metal bands was committed to delivering excellence even when they were likely nearing exhaustion from being on the road for over a month straight. When they told us we were being recorded for inclusion in a future live album, we sang even louder, blowing out our voices by attempting to hit every note ourselves and keeping up the pace during Hansi’s ridiculously long crowd only outros for “Valhalla” and “The Last Candle”. It was a devastating set list full of classics, and the kind of joyous, celebratory mood that only a truly transcendent band can inspire. It was one of the most satisfying highlights of my concert going history, one that’s been hard to shake. In the next few weeks and now months, I’ve begun to revisit the entirety of the band’s catalog from start to finish. In the process, I’ve gone over the setlist we got in Houston, and thought about what inclusions I’d love to hear in my idealized Blind Guardian show. I’ve realized that most of the songs I’ve picked out were ones that didn’t get talked about much by the Blind Guardian fanbase as a whole. I don’t think its due to anyone disliking them either —- I suspect its just that they tend to get overshadowed by the widely hailed classics on their respective albums whenever the subject of your favorite Blind Guardian songs comes up in various Facebook comment threads or message board discussions. I did a bit of checking on Setlist.Fm and realized that with an exception or two, most of the songs I’ve picked out are ones that hardly get played live at all. Their lacking presence on the band’s set lists tour after tour has perhaps largely contributed to their status as deep-cuts, a grouping of songs every band has, and whose fans’ only hope at hearing them live is for An Evening with… styled tour (hello Iron Maiden and most of Somewhere In Time). So here’s my alphabetically ordered list of what I consider the ten best of Blind Guardian’s overlooked songs, those gems still hidden beneath Smaug’s long, foreboding shadow. Were we to have a hypothetical, NCAA March Madness-styled contest for the most “metal” metal song of all time, I’d select “Another Holy War” as my candidate. It’d soar through early rounds with ease, get through the sweet sixteen and elite eight on some nail biters, have a truly epic OT victory in the final four, and would be in a jump ball, anyone’s game showdown with Maiden’s “The Evil That Men Do” for the championship (on this issue there is a no debate! /#Papi#Seinfeld). So how can such a devastatingly awesome, powerful, and adrenalizing metal classic be considered underrated? I’ll refer you to Blind Guardian’s Setlist.fm statistics, where they have played this gem a mere sixteen documented times! Sixteen! Once in 95 shortly after Imaginations was released, then most famously as part of their 2003 Blind Guardian Festival setlist (as captured on the ‘Looking Glass live DVD), and finally only at a smattering of festivals afterwards (most recently at a show in Stockholm in 2010). And I get it —- this is a damn tough song to pull off live, not only because you need at least two solid back-up singers to fill in the backing vocal parts during the chorus, but also because in its original studio incarnation Hansi actually sings over himself quite often. His lead vocals on the pre-chorus lyric “I am your light on through the night” gets overlapped by the first words of the chorus (“Why am I born”), as well as his epic vocal extensions at the end of verse lyrics such as “I will die before my vision ends”, where in his own inimitable way he gets as much passion out of that final word as possible (see the 1:51 mark for reference). In fact, you’re hard pressed to find moments where vocal sections don’t overlap one another by at least a second or two, and they all contribute towards building this palpable sense of violent urgency throughout the song, that Hansi is racing ahead of his band members and its out of his control. Its all by design of course, a result of the band’s pure devotion to their studio craft… that nothing, not even the complications of a playing a song live could alter their course in sculpting a piece of music to achieve exactly what they envision. And what they envision out of “Another Holy War” is a concentrated barrage of rage with Hansi as its physical manifestation. His performance is masterful, unlike anything we’ve ever heard in metal and the only piece of evidence you need to put prejudiced extreme metal fans who pooh-pooh power metal in their place. His half sung, half screamed vocal extensions of certain lyrics here are what his status as a living legend are built upon (refer to 3:22-3:27, and 3:42-:3:46 for further evidence), and that oh so sweet outro guitar melody beginning at the 4:02 mark matched with Thomen Stauch’s classic battlefield snare percussion is the 24k gold band this diamond is set in. Before you spit out your coffee and thunderously ask aloud how I can consider “A Past and Future Secret” as forgotten, I’ll ask you to consider that I’m coming at this from an American Blind Guardian fan’s perspective. Since the band has been touring on our shores since 2002, they’ve aired the song Stateside only once back on November 15th, 2002 at the ProgPower III festival in Atlanta, Georgia (incidentally, their first American show ever). Meanwhile, every single show here has featured the much loved “The Bard’s Song” —- and rightly so, its a classic and no one’s complaining about it. And I get it, most metal shows only have room for one ballad unless you’re Nightwish or Sonata Arctica and even then two is pushing it (it being the patience of a general standing room audience, I for one welcome all belligerent displays of balladry). We love “The Bard’s Song” for its simplicity, for the easiness of it’s vocal melody and how it can be strummed on an acoustic guitar in someone’s garage, or by a campsite at the RenFest —- its by nature a portable song, you don’t even need the guitar. But I’m going to step out on a ledge here and suggest that between the two ballads, “A Past and Future Secret” is actually the better song, both in composition and execution, and a better representative of how malleable, rich, and multifaceted the band’s sound is. Its secret weapon is Hansi’s lyrical perspective, actually setting the scene by endearing to an audience around him, “Listen crowd I’ll tell you everything!” —- though who “I” is the subject of some debate. Some feel the narrator is Sir Bedivere, or an alternation between Merlin and Arthur, while others simply assign the narrator as a bard, shifting in various perspectives as he unfolds this tale of Arthurian drama. Regardless of how you see it, it paints a picture, and gives you a sense of being in a physical place as a listener that defines your experience when listening to it. Andre’s opening acoustic guitar figure is lilting, romantic, and instantly memorable, becoming the motif from which every other guitar and keyboard pattern swirls off of. But its in the layering and juxtaposition of the vocals where the song truly becomes an epic, in those gently mixed down full throated Hansi screams that seem to echo off in the distance. He peppers them in throughout the song, culminating in its climatic apex at the 2:34 mark when he passionately declares “I will wait and guard / The future king’s throne!”, his extension on the final word sending shivers down our spines. Even more than that, I love the call and response section towards the three minute mark, when he passionately sings “It was nice but now it’s gone” like some tortured madman a great distance away bellowing to the open air, his voice sounding like its crossed hills and rivers to get to us. Also worth noting are Thomen’s martial percussion patterns, soft drumming on snares, a deeply ringing suspended cymbal, and booming array of timpani. Thomen doesn’t seem to get enough credit for his imaginative approach to percussion in general, but go back and really pay attention to what he’s doing on those albums and you’ll realize that he drives a lot of their classic moments in the same way that Andre did with his guitar fluidity. What you get on “A Past and Future Secret” that you don’t quite get on “The Bard’s Song” is Blind Guardian on full display, using every trick up their sleeve including Hansi’s crazy powerful Imaginations-era vocal ability (no one ever sounded so melodic yet so brutal at the same time) to create not an opulent, thundering metal epic, but a delicate, brushstroke ballad that makes you emotional about a lyric that comes from myth and fantasy. With “The Bard’s Song”, its simple and direct lyrics could be transferable to our actual lives, but in “A Past and Future Secret”, we suspend our disbelief and step willingly into another world to hear fictional characters’ memories. There’s a moment directly in the middle of this song when it deviates from its tense, palm-muted riff fueled verse and chorus and daringly goes into something of an extended bridge, it starts and ends from 2:56 to 3:17 —- but the precise moment that really does it for me is at the introduction of the lyric, “…Obey my call to the cemetery / And don’t be afraid / To step into the dark…”. Its a transcendent moment. Take a second to rewind back to 2:56 to listen to it again, listen to that build up, Hansi’s choice of extended phrasing around the word “cemetery”, the way Andre’s lead guitars gush forth underneath it all during the next two lines beginning at the 3:07 mark, almost mirroring the vocal melody itself in order to better support Hansi’s emotionally charged performance. There’s something about that small little part, that little deviation in the trajectory of the song that has always captivated me and that I have long associated as a characteristic of truly great bands —- to have the confidence to implement such a remarkable musical moment only once in a song as opposed to hitting it again and again. I’m not suggesting that the rest of the song is weak in comparison, its not, but that part has been the reason “Ashes to Ashes” has stuck in my mind all these years. I have to note here that “Ashes to Ashes” was written about the death of Hansi’s father, marking one of the few times he turned inward as a lyricist albeit still writing with an eye towards the fantastical. This might be a stretch but hear me out: I’ve always felt that the reason that moment sounded so emotional to me was because of how much it truly contrasted with the stony stoicism of the rest of the song. This contrast not only exists in the music but in the lyrics as well, notice how the bulk of the song’s lyrics seem to be about Hansi’s rationalization of death: “Ashes to ashes, dust to dust / The life clock strikes and you obey / Like a candle light that fades… Time isn’t here to stay”. Its hard not to notice how even the vocal approach to those lines is purposefully detached, like its being chanted from afar (the combined choir vocal approach helps). Yet in sharp contrast there’s far more raw emotion in Hansi’s lead vocal during the build up to that extended bridge, as his lyrical perspective turns inward while expressing regret, “Morning is whispering in my head / Too late to say goodbye / Too late”, and of course how ten seconds later we reach our cataclysmic bridge where everything from the music, lyrics, and vocal approach combined just seems to reach an emotional apex. Diving further into those lyrics its hard not to view the entire bridge as a dialogue between Hansi and his father, perhaps not directly but metaphysically, and in its own way being the place in the song where that aforementioned rational stoicism melts away and you hear the emotional grief of a son trying to make peace with the loss of a father. Its followed directly by yet another injection of that stony, detached chorus, like he’s trying to pull himself together after such an emotional outburst. Look I realize I’m getting into a hyper-textual interpretation here, and I doubt that Hansi had all these things in mind when he was writing this song, but that’s kinda the point —- subconsciously this is how he ended up writing this song, and how it affected me. Before I knew that this song was about Hansi’s father, I always regarded its narrator as being really confused about how to feel concerning the concept of death, and as a result often thought of “Ashes to Ashes” as confusing in itself. But after I learned of its origins, I still regarded its narrator in the same way, only this time the song made perfect sense. One of the things I’ve been doing in my revisiting Blind Guardian’s catalog is give a lot of extra attention to A Night at the Opera and A Twist in the Myth, both albums that I had been neglecting in the past few years. The former had the benefit of coming to me anew, with its remixed version appearing on the band’s recent boxset, but unfortunately the Nuclear Blast released Myth didn’t get the same treatment, barring “This Will Never End” in its remixed state on the Memories of a Time to Come best of/remix collection. Why that was the case is puzzling… if you’re going to remix one song, why not do all of them for an album that needed it just as much as its predecessor (if not more so)? I get that the Traveler’s Guide To Space and Time boxed set was a Virgin Germany release and that Myth obviously couldn’t be included on that, but if you’re going through the trouble of updating your entire catalog, how about nudging the guys at Nuclear Blast into re-releasing that album with a new mix as a selling point? Part of me wonders if Nuclear Blast had to pony up for licensing fees for all those Virgin era Blind Guardian classics for re-release on the Memories compilation and they felt they had spent enough already (because while three songs were re-recorded, everything else on the set was simply remixed). Possible interview question for Hansi perhaps? Anyway, A Twist In the Myth is understandably tagged as the worst of latter day Blind Guardian (oh hell, lets just say post 1990 Blind Guardian), with some songs that never took off (“Carry the Blessed Home”, “Straight Through the Mirror”), a radical change in style and sound (“Another Stranger Me”, “Fly”), and just an overall feeling that the whole affair was a bit underwhelming. I remember debating my theory at the time of its release with another Blind Guardian fan, that Myth was a deliberately different production approach in direct reaction to how A Night At the Opera was perceived as overproduced. He argued that no one could reasonably say that Myth was under produced, but I think we settled on both agreeing that it was badly produced. It seems weird to say that about a Charlie Bauerfeind album, but in retrospect it seemed that both Bauerfeind and the band had to take those first two albums together as a sort of calibration period that finally resulted in them getting on the same page for 2010’s At the Edge of Time. Even now when I go back through it front to finish, I hear those production side blemishes: Hansi’s vocals seem at times over-processed; the choral vocals aren’t pushed up in the mix enough; the guitars sometimes fall back into the mix to be buried under the keyboard arrangements; and speaking of which, the keyboard built arrangements can be all over the place, with a preponderance of odd sound effects instead of pure orchestral accompaniment. On “Lionheart”, all those tendencies popped up in possibly the worst configuration —- yet for all its flaws, it rises on the strength of being one of the band’s best ever songs, with a chorus that could level a shopping mall. Built upon a truly inspired series of overlapping vocal melodies where the verses are just as compelling as the refrain, no time is wasted in a long instrumental build up as twenty-seven seconds in we hear Hansi usher us in with an ambiguous lyric, “Speak to me / It all would be easier / I want to talk to you”. What you don’t really hear with clarity due to its muddled mix is the repeating chant of the underneath backing vocals singing “Just let me out of here”, a sonic tidbit that requires some good headphones to detect. Let me pause here and again just marvel at how easily this band seems to conjure up vocal melodies that sound epic on the surface, and resonate with us beyond a surface level, and that’s just the intro! Frederik Ehmke delivers a monstrous percussion performance here, just pummeling us with double kick and furious, battle-inspired drum patterns that violently shake all throughout. And Andre’s inventiveness pops up in wonderful ways, such as his alliterative riff sequence (see :45-:53) during the pre-chorus bridge. As for the chorus itself, try listening to this song while reading along with the lyrics and see how many lines you’ve been missing simply because they’ve been submerged by a faulty vocal mix. You don’t get to hear huge chunks of whats actually being sung, not with clarity anyway. Its a shame because I dare anyone to deny this song’s greatness —- but its begging for a remix, for it to never get one would be a disservice to all Blind Guardian fans. Its understandable that the first songs you’d think of when considering Nightfall in Middle-Earth would be “Mirror Mirror”, “Nightfall”, “Time Stands Still (At the Iron Hill)”, or even “Into the Storm” —- because duh! (insert pic of Batman slapping Robin here). It would however be a crime if you began to neglect listening to the rest of the album in some sort of misguided yet gallant attempt to create a best of Blind Guardian playlist on your iPod. The truth is I could’ve picked from a number of forgotten deep cuts off Nightfall, and in fact almost chose “The Eldar”, that doomy gloomy piano ballad that was imagined as Finrod Felagund’s dying lament of regret and farewell (its power is slightly diminished when you consider that things worked out for him in the afterlife with that whole getting to return to Valinor to live for eternity with his long sundered love Amarië kinda thing). But if we’re taking the concept of the album and its source material at heart, then no other song should stand out more for its sheer heartbreaking passion and sentiment than “Noldor (Dead Winter Reigns)”, as it so perfectly captures that agonizing path that led the Noldor towards war and destruction. First there’s its opening guitar figure, composed of romantic yet somber notes that serve as the bedrock for the see-saw melody that is draped over the song’s refrain. The Savatage-esque theatrical drop in of every other instrument briefly suggests that we’re in for something uptempo, but then those choir vocals kick in and we abruptly shift to something more mid-tempo, the unfolding of a moody, bi-polar song that at times quietly seethes and then furiously lashes out in a sonic tantrum. So erratic is the structure of the music here that at times it seems like you’re listening to entirely different songs, such as the shift from those aforementioned choir vocals to Hansi’s solo verse vocal, “We were lost / On grinding ice / In fear and hunger…”, all the way back again to the pummeling speed metal uproar during “(You) can’t escape / From my damnation / (Nor) run away / From isolation”. That pre-chorus transitions to a bridge that contains one of Hansi’s most glorious vocal moments ever, namely, his primal high note extension on the last word of the lyric “Hear my words / Fear my curse” hitting you like a shockwave completely out of nowhere. When you try to explain why Blind Guardian may just be the best metal band of all time to some plebeian, its difficult to articulate just how utterly majestic a specific moment like this one is —- words can’t come to mind that sufficiently describe it (and around that time the person you’re talking to nods and changes the subject). The awesome final note of that bridge by the way transitions into one of the band’s most beautiful and underrated choruses. It seems silly to ask this, but are we collectively underrating Hansi as a lyricist? Because I’ve rarely heard, read, pondered over a stanza of lyrics as perfect as “I know where the stars glow / The sky’s unclouded / Sweet the water runs my friend”, a brushstroke of imagery that affects you for its cosmic spirituality, but then deepens in significance if you’ve read The Silmarillion (or seen the iconic cover art that graces its most common edition). The vocal melody that those words are sung to, with the help of lush layered lead vocals and group choral vocals all works in tandem to glorious effect —- its a chorus that tugs at me spiritually. The lyrics that immediately follow pay homage to J.R.R. Tolkien’s authorship directly, “(But) Noldor / Blood is on your hands / Tears unnumbered / You will shet and dwell in pain”, with its knowing reference to the prophecy of doom spoken by Mandos upon the Noldor after their kinslaying at Alqualonde: “Tears unnumbered ye shall shed; and the Valar will fence Valinor against you, and shut you out, so that not even the echo of your lamentation shall pass over the mountains.” Yes I posted the whole quote (that’s not even all of it), because its an awesome moment in the book, and you should read it (dammit!). Its worth delving into the lyrical perspectives here, because “Noldor” is essentially a metaphysical dialogue between Mandos (one of the Valar, he being the Lord of Doom aka afterlife) and Fingolfin. Oh if there’s ever a sympathetic figure in The Silmarillion, its Fingolfin. The backstory is a little too involved to get into here, but essentially Fingolfin and his people are in a rough spot, having participated in the kinslaying of the Teleri (elf-on-elf violence) due to their sworn allegiance to the increasingly rage-maddened Feanor in their act to leave the paradise of Aman and depart to Middle-Earth to go after Morgoth (who has just stolen the Silmarils, oh and killed Finwe, the father of Fingolfin and Feanor). Feanor and his people departed on the stolen Teleri ships first, but instead of sending them back for Fingolfin’s people, he burns them after reaching the far shore. Fingolfin sees the fires in the distance and realizes that he and his host will have to go the long way around to Middle-Earth, on foot, through the icy wasteland of the Helcaraxe (the “grinding ice” we hear about in the song). Why would Feanor do such a thing? Because despite Fingolfin’s sworn allegiance, he still distrusts his younger brother —- Fingolfin is born from another mother; he at one time in the past stood against Feanor’s selfishness in withholding the light of the Silmarils from the Valar, and that up to no good Morgoth worm-tongued words of distrust to Feanor regarding Fingolfin’s supposed intentions to be the heir of Noldor (all lies of course). Also Feanor is by this point out of his mind, so blinded by grief and his rage at the loss of the Silmarils that he’s not quite thinking clearly. I think its interesting that Hansi chose to contrast Fingolfin with Mandos’ prophecy of doom rather then Feanor, who gets his own perspective song in “The Curse of Feanor”. It goes to show just how well Hansi understood the source material that he could achieve an even greater emotional impact by honing in on the remorse felt by Fingolfin at this juncture —- losing many of his people along the brutal march through the Helcaraxe, feeling enormous guilt for the Kinslaying, yet still feeling bound to his oath: “See my eyes / Are full of tears / And a cruel price / We’ve paid / But still I can’t claim / That I’m innocent”. His perspectives are kept to the verses, while Mandos’ takes over the rest of the song. Its hard to tell if that gorgeous chorus is a split between him and Fingolfin, or if its just all Mandos —- I’m inclined to think the latter, because of course the place with sweet waters, unclouded skies, and glowing stars that he’s referring to is Arda, home of the Valar and the place from which the Noldor who left are banished from. When I hear the Mandos perspective lyric “And the lost / Who will not reach the / House of spirits / (Will) grow old and weary”, I think of Galadriel much later on in the third age, lone surivor of the Noldor who left Arda, with her bleak outlook on any possibility of returning to Arda, with the guilt for all she’s seen for thousands of years weighing down upon her. From one fan of The Silmarillion to another, Hansi is communicating some of the unwritten emotion present in Tolkien’s true masterpiece. Thanks Hansi! So much attention has been paid to the fourteen minute long epic that is “And Then There Was Silence” before and after the release of A Night At the Opera that it sometimes seems as if the rest of the album has been sitting in its shadow. Certainly no other track from the album was played live on the band’s recent American tour, and it ranks as the most played song from this album since its release in 2002 (again according to Setlist.fm stats). Now let me preface this by saying, I do adore that song —- for weeks and months from its CD single release in November 2001 til the album release in March 2002, it was the only new Blind Guardian I had to listen to (well, that and its b-side “Harvest of Sorrow”). And boy did my Blind Guardian loving friends and I listen to it, over and over and over again, up until when the album was finally released and we were so burned out on it that we skipped over it during spins. I gave it a long miss for many years, honestly only hearing it when the band played it live in 2006 and 2010, and when they re-recorded it for the Memories of a Time to Come collection. Hearing it in a fresh recording gave me new appreciation for it, witnessing it performed live again bolstered that enthusiasm, and lately I’ve found myself humming various sections of it at random. A year after the re-recording of “And Then There Was Silence” came another surprise: a completely remixed version of A Night At the Opera on the band’s A Traveler’s Guide to Space and Time boxed set. The band had murmured about the possibility of remixing it in interviews for years, and for awhile I chalked it up to wishful thinking (on their part and mine). Alongside many others I had always felt that the original release was a tad overcooked; perhaps too much compression of certain layers in the recording, too many vocal tracks, whatever it was —- the album could be a chore to listen to, an aural equivalent to an Australian’s nightmare, as Spinal Tap manager Ian Faith would put it. The remix breathed new life into its songs, adding space between instrumentation, bringing up interesting musical elements that had been trapped behind walls of noise, loosening up the layering of choral vocals so they could pop more. On the whole, I thought it was a triumph… oh, except for the deleting of one of the most epic moments from the best song on the album. Yes I’m referring to “Precious Jerusalem”, finally we’re here! Before I heap praise upon it, I have to take issue with the band and ask: Why was the decision made in the remixed album to delete the line “Let’s celebrate the dawning of the sun” at the 1:23 mark? Its such an integral musical segue from the intro verse to that first glorious rendition of the chorus that its absence in the remixed version seems unnaturally empty and incomplete. For the purposes of this article and you the reader, I’ve linked the original version above (and while I love and recommend the remixed album over the original, I’d urge everyone to replace the remixed “Precious Jerusalem” with the original for their tracklisting). The band has elected to avoid touching “Precious Jerusalem” live, likely due to the necessity of the song needing a strong backing choir to even get close to pulling it off. The patterns of the vocal melodies are reminiscent of “Another Holy War” in a fittingly similar way (both songs lyrically seem to touch on the same topic) in that bridges and choruses begin while the previous verse, bridge, or chorus is finishing up on its last line. It works towards the same effect here, to build up tension and deliver epic payoffs, and it succeeds on both counts. I’ve always loved the lyric on the dramatic bridge, “I’ve gone beyond but there’s no life / And there is nothing how it seems / I’ve gone beyond but there’s no life / There is no healing rain in Eden”, its imagery suggestive of both physical and spiritual journeys. But its the chorus that houses the song’s emotional core, “I turn to you oh my precious Jerusalem / Deny your prophets their passion and treat them like fools / I turn to you oh my poor old Jerusalem / Deny my love but you can’t change fate”, with Hansi and his longtime choir emoting and inflecting just enough on that third repeating line to give it an extra dose of ache —- it sounds like these guys are pained singing this song, in a good way. Oh one other vocal related thing, how brilliant is Hansi at understanding alliteration and the value of repetition when he sings “I’ve found myself in desert lands in desert lands / But you’ve been on my mind”? Repeating “in desert lands” twice not only works syllabic-ally but reinforces the unending and repetitive nature of what we think of as Middle-East desert landscapes. It has a passionate yet tortured quality to its overstatement, so when he follows by singing “…you’ve been on my mind”, it makes you wonder —- for how long? Easily the most cinematic song off Somewhere Far Beyond (and the band’s career at that point), “Theatre of Pain” was also one of the album’s mid-tempo numbers alongside “The Quest For Tanelorn”, the aforementioned “Ashes to Ashes”, and the epic title track. In tandem they redefined the band’s sound, building the path that lead them away from mostly speed/thrash metal and paving the way for the birth of their classic sound on Imaginations From the Other Side. What sets “Theatre of Pain” apart from those however is its panoramic use of keyboard orchestration to create a Hollywood-esque backdrop for Andre, Marcus and Thomen to play off of. So prominent was the orchestral arrangement for this song, that the band delivered a “classic version” on their 1996 rarities collection Forgotten Tales that pushed up both Andre’s lead guitars and the keyboards to the forefront. There was a time when I preferred the classic version, but over time I’ve come back around to the more raw, desperate push and pull of the original. Hard to believe that a song that the band saw fit to release in two incarnations can be overlooked by the fanbase at large but I hardly ever seen anyone mention it as a favorite. I guess its the price it pays for being on an album with “The Bard’s Song” and “Time What Is Time” (although I guess its not that surprising considering that once again, the band rarely plays it live). I had a hard time coming up with an adjective for this song besides cinematic, but perhaps its a little swashbuckling? Not in the dumb Alestorm kind of way, but in the sense that its streaked with a touch of adventurous spirit in its see-saw swagger and overtly fantastical lyrics. Speaking of the lyrics, they’re apparently inspired by a 1979 sci-fi novel called The Merman’s Children by Poul Anderson, a book that I’ve never read but seems interesting its in premise. Needless to say, its hard to grow attached to lyrics that are so specific to unknown subject matter as they are here, but there are some standout moments, the most vivid to me being the chorus itself: “Don’t fear your last step / From the theatre of pain / And the children will love your singing”. To be honest, I have no idea what those lines mean, their specificity is the only aspect I can critique —- but their reassuring intention and tone seem obvious enough. And despite you asking yourself while listening to it one day, “Just what is a theater of pain anyway?” as I did, its Hansi’s delivery and the well timed joining in of the chorus vocals that have always made this a feel-good Blind Guardian song. Lost amidst a dense tracklisting between”Into the Storm”, “Nightfall”, and “Mirror Mirror” is this severely overlooked / under-discussed gem. Funnily and cruelly enough, the band unleashed their debut airing of this song just one show after their Houston date in Atlanta. It was hard to be bitter about it at the time while still riding high on the excitement of the show, and of course any cursory understanding of the tragedy of Feanor in The Silmarillion should be a warning for holding grudges and being selfish —- that being said, I still can’t help feeling a little robbed of hearing this glorious anthem live. But hey, I’m happy for my Atlanta brethren, it was about time the band played this in concert and its nice to see that an American audience got a live debut of a song for once (no I’m not gritting my teeth!). This is one of the most aggressive songs off Nightfall, just punishing you with heavy, barreling riffs and percussion after Andre’s joyously opulent lead guitar intro. At first listen someone might expect this to unfold in a fairly standard manner, with a cliche power metal chorus to follow, but Blind Guardian are nothing if not tricksters. We hit the bridge, and our racetrack tempo slows down, Hansi’s vocals briefly turn to a gentle hush, all before aggressively building towards the chorus where another tempo shift occurs, this time to a mid-tempo, almost stately march. Its in that chorus where Hansi once again displays his masterful command of the song’s source material in crafting a perspective based chorus that brings you right into the heart of Feanor’s despair and fury. The lyrics in the chorus are flawless, “Don’t fear the eyes of the dark lord / Morgoth I cried / All hope is gone but I swear revenge / Hear my oath / I will take part in your damned fate”. Its partly addressed to his followers in the house of Finwe, but also to himself and aloud in the air to Morgoth, quite a lot for one chorus to be getting on with. The unusual and of course brilliant feature of “The Curse of Feanor” is how that chorus seems to be extended by virtue of a mid-chorus bridge where a brief guitar solo introduces a tempo change in the rhythm section and Hansi delivers another searing lyric, “I will always remember their cries / Like a shadow which covers the light / I will always remember the time /But it’s past / I cannot turn back the time / (I) don’t look back / There’s still smoke near the shore / But I arrived / Revenge be mine”. Okay there’s a lot to point out here: First, how about another shining example of Hansi’s choice to repeat a word or phrase for dramatic effect ala “Precious Jerusalem”, in this case how he repeats the “I” in the first line “I will always remember their cries” —- its a small thing I know, but it makes Hansi’s interpretation of Feanor come alive, become tangible and almost conversational (even though its real use is for the vocals to synch in better with the guitars swooping in). How about “Like a shadow which covers the light”, a general bit of imagery that can speak to the non-informed listener yet also speaks directly about the stolen Silmarils? And I’ve always loved the inclusion of “There’s still smoke near the shore”, because it reinforces what was suggested with “I will always remember their cries” —- that Hansi’s interpretation of Feanor brings with it some remorse for the kinslaying at Alqualonde. Is it too much for someone to get Hansi on a podcast and just talk The Silmarillion for an hour or so, is it really that hard? I’ll even take a print interview, but enough questions about tour dates and recording processes. Let’s talk to the man about Fingolfin (go-with-the-flow rube or saintly hero? ); Glaurung’s candidacy for greatest fictional jerk of all time; Feanor or Turin Tarambar? (who was dealt the worse hand? ); why couldn’t Morgoth have found Gondolin with some aerial scouting by one of his flying baddies? ; and what were the real estate prices like in the Blessed Realm anyway? This might be THE most overlooked Blind Guardian song of all time, not only because the band has ignored it live, but because it rather unjustly seems absent from any discussion I’ve seen regarding fan favorites. If we’re to go by the lyrics alone then we can consider this to be the bards’ first and only love song, a surprise considering the depth of their catalog. But hey, being Blind Guardian this isn’t just a regular love song, its based on the tragic romance of Tristan and Isolde of course! Many years ago, one bleary night around two in the morning while lying beached-whale-like in bed, I caught an opera performance of this on PBS that was subtitled. I remember it vividly for being the first opera I actually watched from start to finish (because it was 2am and the remote control was somewhere over there *points vaguely*), and surprisingly enough I actually enjoyed it in some small way. Anyway, Hansi essentially took a few important moments from this classic story and stitched together two perspectives of different characters. Without getting into the story (because its been awhile), we get a little bit of King Marke of Cornwall and his “testing” of his soon to be betrothed Isolde’s innocence, and we get Tristan who in his grievously wounded state is crying out for his true and sundered love (Isolde!). Look, you get the idea. What A Night at the Opera brought in spades was an aggressive expansion of the band’s sound that a lot of people just lazily term as “progressive” —- which yes it was, but the band opened up their sound by reducing their usage of straight ahead metallic riffs, building songs around vocal melodies and lead guitar motifs, as well as increasing the role of keyboard designed orchestrations. All of which are cornerstones of “The Maiden and the Minstrel Knight”, which is largely built around Hansi’s lead vocal melody alone, so much so that you’ll notice hardly any instrumentation during the beginning verse apart from keyboards that echo his tune. Its a daring way to write a ballad, one that gets even more daring when the group vocals join in during the chorus (“Will you still wait for me? / Will you still cry for me?”), as Hansi cedes his spotlight at a moment in which most other vocalists would want to seize it. Guitars don’t kick in until the 2:12 mark, and despite the punctuating kick they deliver, they’re still secondary in nature even considering Andre’s excellent solo that works as the set up for the song’s best moment. That moment spans nearly a minute from 3:14 to 4:12, where intertwining lead vocal melodies work alongside group vocal layers to create breathlessly beautiful harmonic bliss. The lyrics during this segment speak of loss and ache, and despite their call and response nature between Hansi and the choir they seem to read as one long run-on train of thought. Had this blog existed in 2010, Blind Guardian’s At the Edge of Time would have sat atop 2010’s Best Albums of the Year list. It was the return of the bard’s classic speed and power metal styles infused and expanded with their post-2002 experimentation. It boasted not just one, but two supreme epics in “Sacred Worlds” and “Wheel of Time”, as well as neck-snapping cuts like “Tanelorn (Into the Void) and “Ride Into Obsession”, which seemed like modern distillations of the band’s early 90s era. 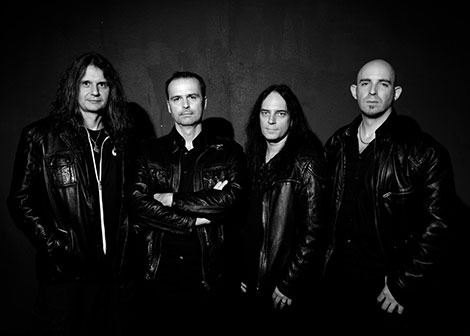 Even the slow burning cuts were compelling, “Control The Divine” and “Road of No Release” were twisting and complex with their inspired tempo/riff changes; “Valkyries” soared with its cinematics; “A Voice In The Dark” brought us a quintessential Blind Guardian classic; and “Curse My Name” was a stirring, jangly acoustic guitar driven ballad in the vein of “A Past and Future Secret” that saw Hansi delivering a passion filled lead vocal. But what really caught my ear at that time and still now was the gorgeous, subdued piano ballad “War of the Thrones”, an unusually delicate song in that its subject matter was the violent and bloody tale of George R.R. Martin’s Game of Thrones. It was interesting in itself that they decided to match one to the other, because anyone’s first thought would be that any Game of Thrones inspired Blind Guardian song would be brutal and heavy, but in a strange way, it was a perfect pairing. Its been a mystery as to why it hasn’t gotten a live airing, nor is it talked about that much by fans in general. If you can guess which character(s) the lyrical perspective of this song is based on, you’re far better off than I. Some people say Jon Snow, but that doesn’t necessarily add up all the way through. One person on SongMeanings suggested Coldhands, and I’ve heard another suggestion that its actually from Ned Stark’s perspective, as he realizes his time is coming to an end. No matter which you choose there are details that don’t correlate, but does it really matter overall when the lyrics speak of doom but the melodies are sprightly, lilting, and dare I suggest happy? That dichotomy might be the most appealing aspect of “War of the Thrones”, and it starts off at the very onset a few seconds in, with a lone piano dancing into one of the most singularly beautiful moments in Blind Guardian’s catalog, a tinkling melodic figure that could melt icicles (at the :08 second mark to be exact, but the buildup is just as affecting). Hansi’s lead vocals throughout are a balanced blend of sublimely melodic with aggressive accents on specific words for dramatic effect. Lyrically, you’re not supposed to feel as uplifted as you are when the chorus comes around, with its major keys and orchestral swells and Andre and Marcus’ dancing acoustic guitars. Maybe its fair to say that strong melodies will overrule lyrical direction in most cases, and Blind Guardian is no exception. The clincher begins at the 3:45 mark and runs to the very end of the song, where they extend the melodic line of the chorus through to a layered harmony vocal, Hansi directing the choir with additional setups for the group choral vocals. Its my favorite moment on the album, and of the band’s catalog in general, as Hansi sings “Leave a fee for the tiller man / And the river behind” while he and his select group of studio vocalists extend the final syllable on “behind” longer than a normal band would ever think to do. Seriously, who thinks of that?! Its a sequence that brings to mind Renaissance Fairs for me, as I vividly remember listening to the song with friends while driving up to one, its cheerful harmonies begging for a sing-a-long. Its also emblematic of the nature of Blind Guardian, to not shy away from all manner of emotion, nor from wearing their heart on their sleeve. Wow epic and great idea for a post! I can’t believe and for some reason I find it shocking that Another Holy War hasn’t been played live often! So which will be the deep cuts from Beyond the Red Mirror? I think if I had to include Red Mirror songs (I didn’t since its so new) the default choice would be “Distant Memories” simply by virtue of being left of the standard jewel case edition of the album. Why they did that I have no idea. I like this type of post (like the excellent Falconer one!). ‘Somewhere Far Beyond’ (the song) – underrated and rarely played (if ever) despite being the title track of the celebrated album, lyrically it’s a fairly standard retelling of Stephen King’s fantasy epic up to the point that existed in 1992. But musically, what an awesome speed metal epic, a breakneck gallop through a variety of parts, including a bagpipes break. It’s dramatic as hell, with some of the best of Andre Olbrich’s mad polka leads and just the right shade of symphony in the rousing multi-voiced chorus. Wow, I thought I replied to this but it disappeared. Hmm… Anyway I was originally saying that yeah I quite like Thorn but Nightfall really was a tough one to analyze. Its obvious that most people think of “Nightfall”, “Mirror Mirror”, and “Into the Storm” straight away as the go to classics, so everything else was up for consideration as being underrated and overlooked but in having to pick the best of those two categories, there’s no way I could look past “Curse of Feanor” and “Noldor”. I really , really had to go through hell with myself to exclude “The Eldar” from the final ten, but then again that’s why imposing number limits on these things tends to produce a little more thought in how I have to select things. You’re dead on about “Somewhere Far Beyond” being incredible —- however they play it quite a bit in Europe, it was on the live DVD (Imaginations Through the Looking Glass) whereas “Theater of Pain” seems to get shafted all over the place. Another Holy War is probably one of the greatest songs they’ve made. At least the best under 5 minutes. Fabulous article…so well written and researched. My ideal Blind Guardian concert would last for hours .. there are so many tracks I’d love to hear live! And let’s face it, Hansi could sing the Krefeld telephone directory and it would sound epic!! Thanks! And yeah I think my ideal show would be a minimum 3 hours —- Hansi can have a break somewhere in the middle if he needs it though. We’ll sing the Bard’s Song for him too! Excellent list, well written article. I’m quite glad you put “Another Holy War”, “Noldor” and “The Maiden and the Minstrel Knight”, the first being my favourite song from my favourite BG album. I went to their concert last year at the Bataclan in Paris, France. Still got shivers and chills from Hansi’s voice. Having them play “A Past And Future Secret” was a wonderful moment. It was almost magical. Overall, I spent a great night there. Interestingly, most of these songs are my personal top picks. Apart from War of the Thrones, whatever version you take – not even Hansi and André can make me enjoy that GRRM gorefest (although a brilliantly written gorefest, from a technical standpoint, and yet – nothing I can relate to in there). Actually even the seemingly “simple” songs off Nightfall and beyond, they are all rather challenging. It’s becoming sort of fashionable to slam Hansi’s singing in certain circles (like, “he’s growing old”, as if it ever mattered for singers who have good technique), but if they only knew what it’s like, to haul around all those 3+ octaves and keep them in shape for those neverending melodies where you barely have a chance to take a breath. Wow, I’ve never actually seen anyone slam Hansi —- I’d be shocked and appalled if I did (and thems’ fightin’ words!). I think “War of the Thrones” is as glorious a ballad as the band has ever written and performed, and if you think about it lyrically, its more about the philosophical ideas that inform the Song of Ice and Fire series rather than the grisly violence portrayed in the (awesome) tv series. Those wonderful choral vocal extensions towards the end are the kind of musical ear candy that melt my heart. “Wait For An Answer” is a good song, with a deceptively catchy chorus, but not a favorite of mine from that album nor a song that I feel is overlooked, but fair play, everyone’s overlooked BG songs list will be different! You’re lucky, then. I lost count of the youtube/blabbermouth/facebook comments in the “he’s past his prime” vein (to put it mildly), and I even saw this type of comments on the official BG forums. It really makes me angry that there are people who would spread this sort of negativity, which isn’t even remotely true, grrr. Regarding “The Curse of Feanor,” I was fortunate enough to attend the Atlanta, GA show, and it truly was an amazing anthem live. Sorry, I know you (rightfully) felt a little robbed – but the entire show blew me away so much that I’m going to travel to see them live again in a month. I’ve been to many concerts, but this was my favorite. Great choice of songs by the way, especially the often overlooked “Lionheart”. I personally would’ve added “Thorn” to the list, as that is also a great song as mentioned above. The bards coming back to Houston in a month to do the entire Imaginations album is more than enough of a make-up for that Curse of Feanor loss! And “Thorn” was one I strongly considered, I really do love it. Springtime Metals: New Music From Eluveitie, Thormesis, Devin and More! March Mouthful: Queensryche, Children of Bodom, Tyr and More! The 2019 Winter Blast: Swallow the Sun, Soilwork and More! The Metal Pigeon on Instagram! Hell's Heroes II was a pretty great experience, and to see Visigoth, Cauldron, Exciter, Bat, Omen, Power Trip in one night was as they say, a treat! Shout out to Matt Ryan for buying this Visigoth shirt for me because he felt the band deserved more money, cheers bud! Get The Metal Pigeon via e-mail!